The need to combine the fragments of two photos there quite often, so the operation of opening multiple files in Adobe Photoshop is one of quite commonly used. Depending on your preference to open two pictures in several ways. Press CTRL + O, if you want to open each photo on a separate tab in the graphics editor window. These "hot keys" replaced by command "Open" under "File" menu of Photoshop and start the dialogue select images to load into the editor. Using this dialog locate in your computer the first file of the pictures and click it with the mouse. Then just find the second and also click it but hold down CTRL. The result sees the line "file Name" the names of the two files listed, separated by spaces. This way you can open more than two files simultaneously. After pressing the "Open" button the editor will load you mentioned photos, by placing each on a separate tab. Start Windows Explorer, if you do not want to use the standard open file dialog Adobe Photoshop. This can be done by pressing WIN + E or double-click the shortcut "My computer" on the desktop. In Windows Explorer, locate the folder with the photos. Place open Windows Explorer and Photoshop so that was a possibility from the file Manager drag and drop the selected file in the editor. Then click the file one of the photos and by pressing the CTRL key and click the second. Highlighting this way both, drag them to the window of Photoshop. The editor will understand you correctly and will open both pictures in separate tabs. 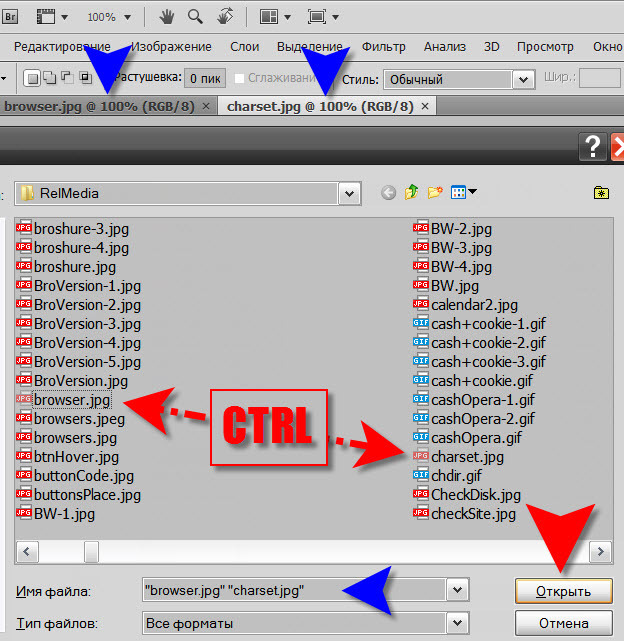 It is possible by this method to select and drag and drop photos without a file Manager, for example if they are stored right on the desktop. If you need to open two pictures, by placing them to one another, it is possible to do it in two steps. First, open the first photo, pressing CTRL + O and then selecting the desired file and click "Open". The editor will upload the picture, and you open the menu "File" and select "Place". Again this opens the file selection window and you should find a second photo. When you click Open, Photoshop will load the second image in the same layer in which it is placed and the first picture, while enabling the transformation mode for the second photograph. To reduce or enlarge the second picture it is necessary to move the mouse nodal points in the corners of the rectangular selection around the photo, hold down the SHIFT key. You can change the position of the second pictures in the background of the first, dragging it with the mouse or pressing the arrow keys. When you are finished positioning the inserted image, press Enter.